Cataraqui Shores Housing - Strasman Architects Inc. 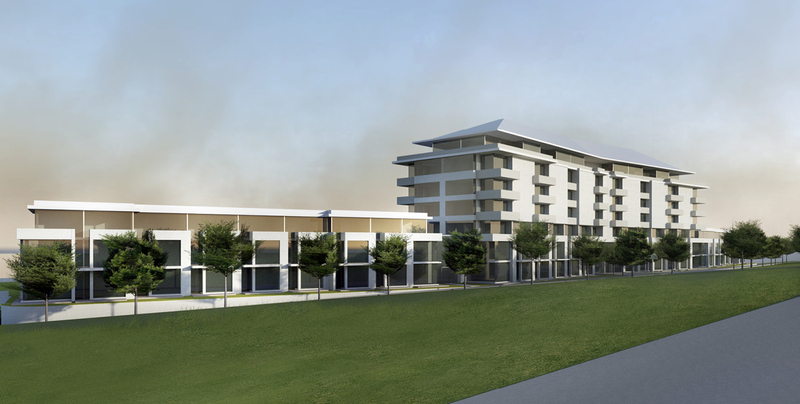 The site for this proposed 160 unit development is a 10 minute drive east of the downtown core of the city of Kingston Ontario overlooking the Great Cataraqui River and the South Shore. The site is connected to the Rideau Canal System and minutes from several Kingston Marinas. 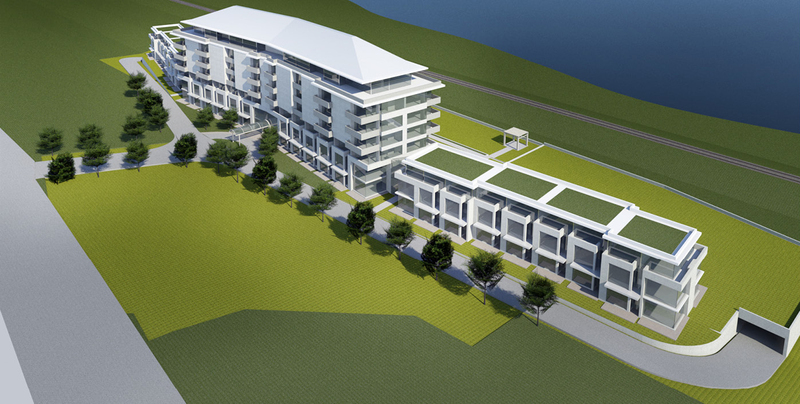 The site is also on the planned waterfront walkway system planned for the City of Kingston. The development consists of 3 buildings. There are two 3 storey Townhouse wings consisting of 24 Townhouse units each on either side of a central 7 storey tower which also has a 3 storey Townhouse base. Because of the magnificent waterfront views we developed a skip floor system which gives each townhouse a view of the water and the possibility of 2 storey spaces with overlooks. Because the rail line lies between the property and the Cataraqui shore we put the parking at grade and built a deck over. Parking is also provided under the Townhouses with direct access to the units. The landscaped deck above the parking provides uninhibited views to the water ,acts as a sound buffer for the trains and provides a large deck area for the complex as well as private patios for the ground floor occupants of the Townhouse units. The seventh floor is stepped back from the face of the building with a peaked roof creating two storey spaces and large private roof top terraces.